Courtesy of the Archives, California Institute of Technology. By the spring of 1910, the pioneering geneticist Thomas Hunt Morgan was growing frustrated. Years earlier, hoping to study mutations to forge an understanding of how species arise, he had stocked his Columbia University laboratory with one-quart milk bottles filled with millions of fruit flies (collected from ripe bananas on the windowsill), then waited for a mutant to appear. 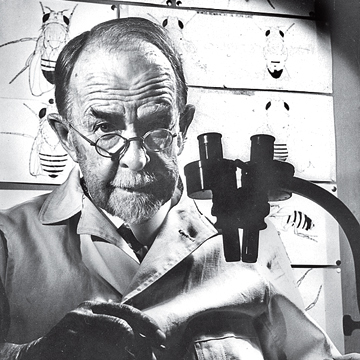 One hundred years ago, after Morgan’s constant search for apparent mutations, a white-eyed fly appeared amid swarms of red-eyed Drosophila melanogaster.